Posted on Wed, Aug 5, 2009 : 8:59 a.m.
Every couple of days I'm copying and expanding on my recent twitter reports. Here are the latest. The mayapples, Podophyllum peltatum, I put in my windowsill are ripe. They have changed from green to yellow. I had my first taste ever of this elusive fruit. It is sort of like an apple. I taste mango, a citrusy flavor. It is a little bitter (especially the skin); it's tropical tasting, tart, all in all very unusual. Maybe I'll juice them? For so many of these wild things people suggest adding loads of sugar and making jam. Euell Gibbons especially was into adding lots of sugar to everything. Part of the interest in wild foods is tasting something truly different, or at least unusual. If everything is reduced to sweet, then a lot of subtlety is lost. I think I will try a juice, which is also easy to freeze. The taste of mayapple juice will also be different in the winter. But I'll add just a little honey so the flavor is still strong. Please note: The unripe fruit will make you sick. The other parts of the plant are poisonous. 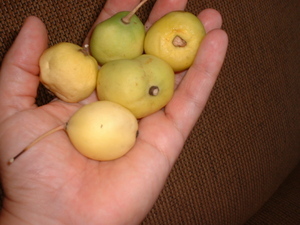 The fruit should be yellow and soft when it is safe to eat. It has taken me this long to taste it because I didn't know you have to pick it green, and then wait. And I finally found a woods with lots of mayapples, few deer, and they were ripe enough but not too much so they hadn't yet fallen to the ground and rotted. A tricky combination it took years to reach! I picked a few tiny milkweed (Asclepias syriaca) pods - under 2 inches. I cooked them with three changes of water and they tasted very nice, clean, mild, pleasant. A new taste for me. From previous posts, you may have noted my aversion to picking this vital food for the monarch butterflies. As far as I can tell, the pods aren't needed by the monarchs so I feel better about using them. The monarch caterpillars eat the leaves. You have to pick the developing pods early though because once they are more than an inch or two the fluffy seeds are developing and that texture and taste would be awful. Milkweed contains a poison, which is removed by cooking, with changes of water. Bring a small bit of water to a boil, add the milk weed pods, cook for 2-3 minutes (you'll notice they turn a brighter green color), drain the water, add more water, bring to a boil and cook another few minutes, again drain the water, add new water, cook for 2-3 more minutes, drain and serve. The taste is a little like soft broccoli, with a greener fresher taste. A little like fresh pea pods, but mushier. They are pleasant both warm and also cold. It is a surprise to chill them and then put into a cold salad, even potato salad! Don't mistake common Milkweed for Dogbane (they look similar early in the year only), and common milkweed has a white sap that some people have a reaction to if they get it on their skin. In Michigan the milkweed with a white sap that sets pods can be cooked to make it safe to eat. Other regions have look-a-likes that are not safe. If you're not sure about this, then skip it. This is a poisonous plant if not prepared properly, and look-a-likes make positive identification a little trickier and very important. I found the first ripe wild apple of the season. So tasty! Ann Arbor, tree city, seems to have thousands of apple trees whose fruit is just falling to the ground unused. Some of the more ornamental trees have fruit that is mealy and not worth picking. But many are fabulous. You just can't tell until you try. This was my first taste of the year, a newly downed apple near the footbridge by Barton Pond. It was wonderful. There is only one way to find a great tree. Try the apples either fresh fallen or pick one from the tree. If it isn't ripe yet, try again later. If it's bad, move on, if it is great then start gathering. But if the apples are ripening, fall is indeed on the way. Untended apple trees have fruit that can be bumpy, wormy, bruised, and just plain ugly. Try it anyway. That is often the tastiest fruit. Carry a knife to cut out the bad parts. I'm learning to make my own soda from berries. First step, make berry juice. I used blueberries, but raspberries are perfect, mulberries, even strawberries. Boil with just enough water to cover or so that they bob. Let cook a few minutes, then I used a stick blender to liquefy them. You could also mash them, but that is a lot of work. I then strained the whole pot using a jelly bag on a stand. Cheesecloth (muslin type) in a large funnel, a colander or strainer would also work. That makes a concentrate. I added some of my honey from my bees, almost a cup total for the gallon. Five pounds of berries made 1 gallon of concentrated juice. To use add 3-4 parts water for each part concentrate. I froze 1/2 gallon for later use. If you freeze liquids be sure and leave lots of space for expansion. I freeze juice and sap and syrup in glass canning jars with no problem. Next step, add lemon and yeast. I haven't done this yet, so I will come back to this topic. The juice (I took 1 part of the concentrate and added 3 parts water) was mild, not too sweet, and with a lovely aftertaste. I'm learning how to do this because my foraging friend has been treating me to homemade black raspberry soda and it is an amazing treat. Better than any "natural" pop I've purchased. It takes a few days to carbonate, and then has to be used in the next few days. But with frozen concentrate, I'll be able to make this all year long. Still eating mulberries off the local trees. Seems like a long season for them. Cool weather. I'm looking for a black berry stand I can pick. I am a local Holistic Health Practitioner and Herbalist. A student of the healing arts since 1973, I published a cookbook "Spinach and Beyond: Loving Life and Dark Green Leafy Vegetables" available on Amazon, Crazy Wisdom Bookstore, and you can also purchase it directly from me. . The cookbook also has a facebook page where people are sharing recipes and ideas. Thu, Aug 6, 2009 : 10:08 p.m. Thanks Allen. I hope that continues to be true. I'm writing about what I love, I suspect you understand that. Wed, Aug 5, 2009 : 8:03 p.m.
Linda - I enjoy every article you've written. Wed, Aug 5, 2009 : 3:04 p.m. The soda recipe sounds great! Wed, Aug 5, 2009 : 2:27 p.m. Thanks Linda Diane, I just took a bite from one of the apples on the ground that i've passed over the last couple of days, assuming they'd be unripe; awesome, sweet n crisp...'n pickin' mayapples green is terrific. I could rarely catch a ripe fruit as they really mushify quickly.